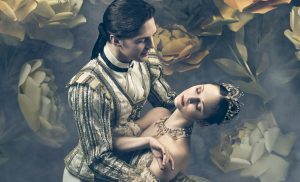 Originally choreographed by the legendary Marius Petipa, Kenneth MacMillan’s direction of the quintessential 19th-century classic ballet The Sleeping Beauty remains true to the great classical technique, demanding power and precision in its style and structure. With an extraordinary depth of talent, this exquisite production is a visually dazzling display of the triumph of the English National Ballet. The opulent set design by Peter Farmer and arresting costume design by Nicholas Georgiadis give this performance a timeless quality that is fittingly dedicated to the famed ballerina Elisabetta Terabust, who passed away in February. This celebrated classic is in four parts. The first is the christening, where the guests and fairy godmothers celebrate the baptism of baby Princess Aurora. Carabosse enters this scene accompanied by what is described by his biographer David Brown as Tchaikovsky’s “patently violent and disruptively energetic” theme. “Act One: The Spell” is set at the 16th birthday party of Princess Aurora, where the audience is entranced by the spectacular performance of Maria Alexandrova, who is wooed by her four suitors. “Act Two: The Vision”, is set 100 years after The Lilac Fairy cast a spell sending the whole palace to sleep. An unhappy Prince Désiré meets The Lilac Fairy, who shows him a vision of the sleeping Aurora. Aaron Robinson shines in his love for the sleeping beauty and a battle between good and evil ensues. “Act Three: The Wedding”, which celebrates the unity of Princess Aurora and Prince Désiré, includes exceptional guest performances by Bluebird, Princess Florine, Puss in Boots and the White Cat. This show was the collaborative work of Ivan Vsevolozhsky, as Director of the Imperial Theatres in Russia, the musical genius of Tchaikovsky and the “unrivalled” choreography of Marius Petipa, which resulted in the masterpiece that is The Sleeping Beauty. The English National Ballet Philharmonic, under the excellent direction of Gavin Sutherland, created a magical narrative of musicality and dance that delivered a richness of emotion on stage, accompanying the outstanding individual performances and guiding the drama of the production. Sleeping Beauty is at London Collisseum from 6th June until 16th June 2018. For further information or to book visit the theatre’s website here.